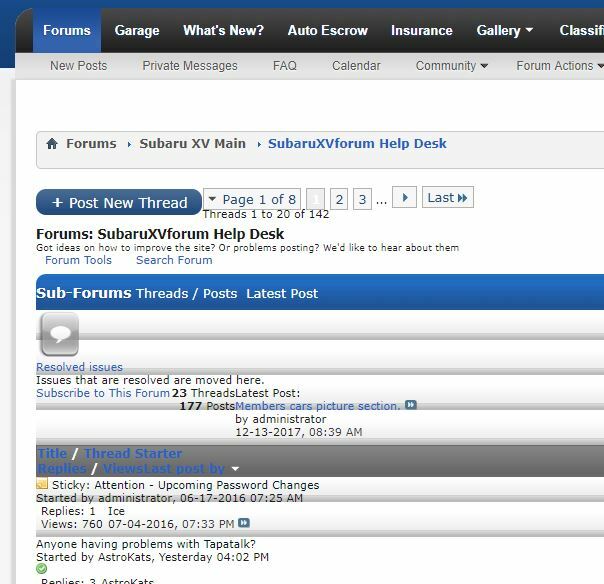 www.subaruxvforum.com is currently unable to handle this request. Chrome here as well Astro, and the site has had a few hiccups for me yesterday and today. Server hiccup. Should be resolved now. Still getting the error message or the layout glitch? None so far. Thank you for looking in to it. Seems good today, thanks Kevin! The dropdown window is clearly way too tall, and clicking on the "New Likes Received" link does nothing. That has been going on for several weeks now. The link always works for me though. Do threads just up and disappear? Troutbum has a 4-pager concerning his car seat material. I posted on it maybe 2 hours ago. THE THREAD IS GONE!